Geared at achieving a healthier experience for both rider and horse, this guide to the rider s position focuses on the back and its importance in riding techniques. 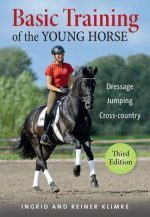 Addressing a complex interaction that is often overlooked, the book explains how a rider s back in constant motion when seated on a horse becomes one of the main channels of communication between horse and rider. Through anatomical lessons and exercises, it also teaches riders how to build stability by positioning their backs in the centre of the horse and improve mobility and control of the back in motion. A detailed training plan shows how to achieve a more effective and attractive riding position and how to deepen the connection between horse and rider. In this new book, Susanne von Dietze, author of the bestselling book and DVD Balance in Movement, explains how to dynamically stabilize your back so you can ride with ‘feel’ and in tune with riding’s demands on your body, and your horse’s, at all times. With meticulously thorough explanations of body awareness, perception, and applicable aspects of physical fitness, von Dietze’s program helps you train without overstraining so you can ride better, longer, while at the same time improving transitions, half-halts, sitting trot, straightness, and collection.